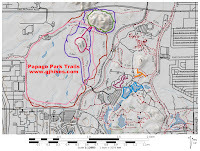 The Elliot Ramada Loop is located at Papago Park in Phoenix, Arizona. Beginning at the parking area the trail follows a loop that leads north along a service road that takes it between Big Butte and the Elliot Ramada. The pavement continues to the 1.2 mile point where the Elliot Ramada and 5k loops share routes as they travel around the west side of the golf course until they separate once again and head back to the trailhead. 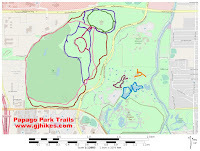 The map at the trailhead shows the Elliot Ramada trail starting out by following the access road that passes between the Double Butte Loop and the 5k Fitness Loop. This part of the trail is wheelchair accessible as are several of the rest stops along the way where there is a curbed edge beside a park bench. For scenery visitors are treated to the unique reddish buttes that contrast with the green desert shrubs which include mesquite and an occasional palo verde tree. The Elliot Ramada sits atop a small rise at the north end of the loop. After passing between the ramada and Big Butte the trail turns back in the other direction where it begins sharing routes with the 5k Fitness Loop. 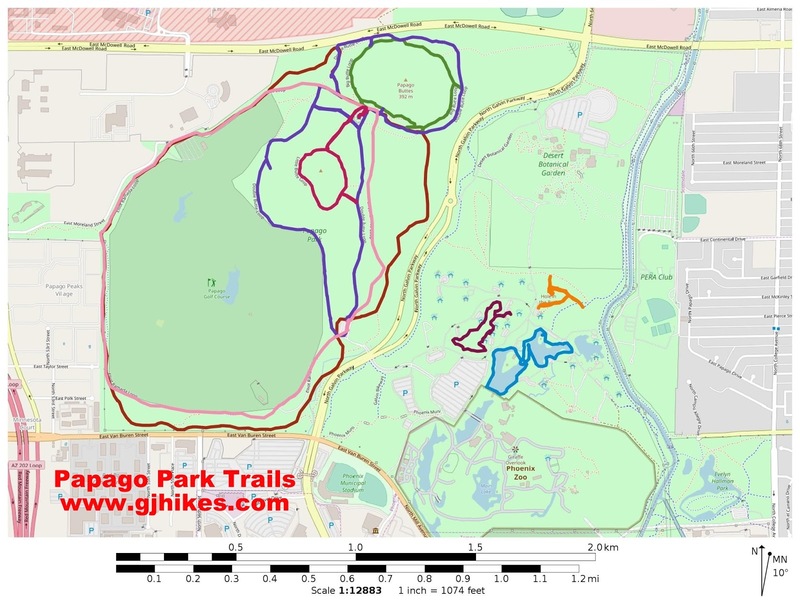 The two trails continue sharing routes as they travel along the golf course fence. After passing the golf course the two trails once again go their separate ways. The spot where the two trail separate might not be completely obvious until you travel a little further along the Elliot Ramada Loop and spot one of the metal posts with a green 2 painted on it. The south end of the loop dashes in and out of several washes that make this section of the trail much more primitive than the paved stretch of roadway and the smooth crushed granite portions of the 5k loop. After traveling around the golf course the trail meets up once again with the access road which it follows back to the trailhead. 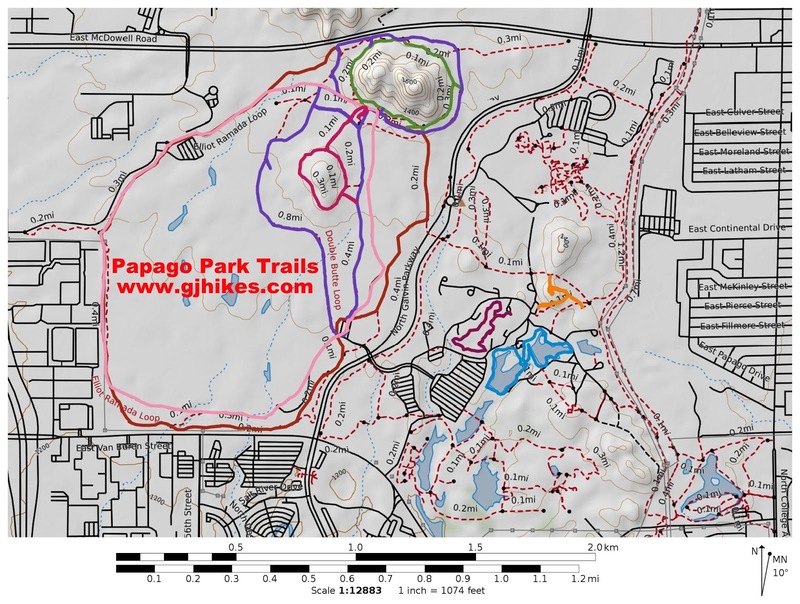 Pretty much all of the rest of the West Papago Park trails can be reached from the Elliot Ramada Loop making it an important artery throughout the park. With a fairly even split of pavement and dirt the loop stands apart from its neighboring trails. If you would like to see it for yourself then all you have to do is 'Take a hike'.